The FERROSTRIKE V-3 is a wearable fire starting system utilizing a magnesium alloy handle, 5/16" x 3.14" (8x80mm) ferrocerium rod and a hand-sharpened W-1 tool steel scraper. The scraper is heat treated to 61 HRC and the edges are hand-honed to produce gobs of sparks when scarping the ferro-rod. The scraper can also be used to scrape the magnesium handle for quick tinder. 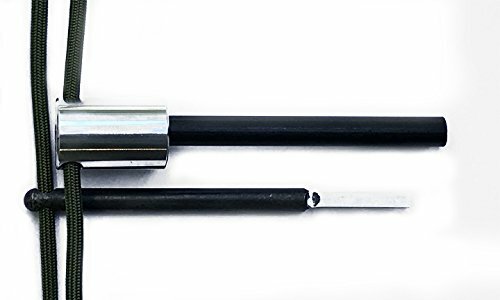 The Round Bar (scraper and steel) is held secure within the magnesium handle via the 3 feet of SurvivorCord. There are no screws or special machining to hold it in place, but it will not come out of the handle even tethered around the neck or pack. The Round Bar is easily removed from the handle by simply pulling the SurvivorCord to the side of the unit and liberating the round bar from the magnesium handle. To return the Round Bar to the handle and secure in place, just slide the Round Bar back into the handle, pull the SurvivorCord tight, and that's it! Even with severe jostling the Round Bar will NOT slide out of the magnesium handle. To make a fire using the Ferrostrike V-3, simply remove the Round Bar from the magnesium handle as described above. With the Round Bar, scrape the magnesium handle to produce a good pile of magnesium shavings. With your tinder bundle handy, use the Round Bar to scrape the ferrocerium rod to generate sparks. Throw the sparks onto the pile of magnesium shavings to light.